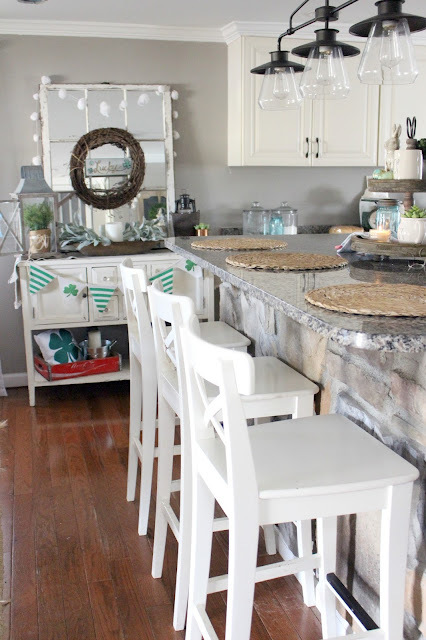 I'I had no intention of decorating for St. Patrick's Day this year, seriously. NONE. With the two Holidays, St Partick's Day and Easter being so close I figured I would just skip out on one this year. Damn you, TARGET and you're adorable cheap Dollar Spot goodies inspiring me to be creative and decorate for EVERY SINGLE THING. I'm only pretending to be mad though, because, let's face it. We all love the dollar spot. Also, I love This Buffet which I've talked about no less then a thousand (and one) times. This buffet is where all the Holiday fun happens. If you've been around for awhile you know just what I'm talking about. Nick Jr. recently learned from some of our family that he has Irish roots, so now he thinks that I HAVE to decorate for St. Patrick's Day. WHATEVER. I dragged the twine wreath in from outside, I think I got it at Wal-Mart for like, $4? Everything else, I shopped the house for. Everything besides the Lucky Sign, The Galvanized Tub(which will double as an Easter Bucket for the hubs! )The shamrock banner and the shamrock pillow. So total, the space cost me about $20 to put together. I ain't mad. I'm not hating this space though, but I'm really anxious to break out the Easter stuff and might do so a little earlier so I can, you know..enjoy it? Are you guys leaving up your Easter stuff for a bit? Now the only thing I have to do is make some lucky charm treats and drink a green cocktail and I'll be good. I might even make a themed meal because, why not, right? So the St. Pats stuff stays up for two weeks, and then it's time for Easter. I'm ready! 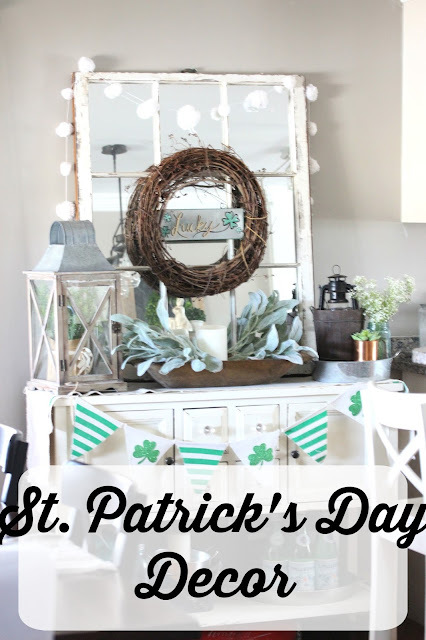 So I gotta know, do you or did you decorate for St. Patrick's Day this year? If so, I want to see! Just tag me in a picture on Insta or leave me a comment below! Gosh, I wanted to decorate for St. Patty's Day this year, but since Easter was so early I just went straight for the Easter decor. Your decor looks amazing, as always! I loooove the shamrock banner! I do not decorate for this but I'm not Irish. I made a craft last year themed to this holiday but actually can't remember where it is? Whoops. Easter stuff has been up since the first. And hey! I hear Dollar Tree has succulents!?!?! I never ever believed in these blank ATM cards so i have always been reluctant to try purchase the blank ATM card online because i know for a fact there are fake hackers out there, but i was convinced that it really works when a very close friend at my place of work got the card & we confirmed it really works, without delay i gave it a go, so i contacted mitchbourne (@) cyberservices.com who helped my friend out, since then i have been able to do alot of personal jobs with him like, Whatsapp conversation, Facebook, Icloud, emails,He does all sort of hacks,He also doesn't request for money first until he has proven to you he is capable of the job and you will be satisfied before sending any cash to him, and the amazing part is he also works with Proofs. I'm glad for his help. Hello! I want to appreciate the effort of mr lewis for helping me gain access into my husband’s phone without physical access..I was able to spy on all his hidden conversations with his secret lover and found out the lady he has being cheating on me with..I already filed a divorce case and want to refer you all to him as he would be willing and ready to help you have a clear picture of things you do not know about your partner.He can also help you with school grade upgrade,cc top and all forms of hacks.Just send him a message at CYBERGOD40@GMAIL.COM and he would be willing to help. I remember my experience with hackers i contacted online, i almost lost hope in finding out if my husband was loyal to me and has been loyal in our 20 years marriage,I lost a lot of funds in paying these so called hackers so i made up my mind that if i get scammed again i'll just forget about finding out what God doesn't want me to know, Then i saw reviews about ( mikejosh@cyber-wizard.com ) and decided contact him and if and if i hear any stupid excuse won't contact anybody and just accept that God doesn't want me to then he proved to me that he isn't a cheat by working a sample job for me but to my greatest surprise he did the job and sent results to me fast, i was so happy but sad part was i divorced my husband, and i will drop an advise for people who wants any kind of hacking services stopped being scammed by people who impersonate being hackers, contact ( mikejosh@cyber-wizard.com ) for a fast and clean job. Thank me later.